Jacobs Wind Electric Company, since the mid 1920s, has been designing consumer wind systems sized to the changing distributed electric loads of their periods. The firm was started by Marcellus and Joseph Jacobs after local interest in their wind electric system for their family’s Montana Ranch brought them requests from neighbors to provide them with wind generated electric power. M.L. & Joe moved the firm to Minneapolis in 1931 to begin production of improved wind/engine distributed energy systems which were sold, through dealer networks, in the U.S., Canada, and Mexico, as well as on every major continent. Before production ceased in the late 1950s, about 20,000 Jacobs Wind Energy Systems® (1 – 3 kW) were shipped from Minneapolis. Now with new incentives, a number of our older 1-3 kW wind systems are being refurbished for yet more years of production. One we made in the 1940s is now running in the Caribbean. If you have one of our historic wind systems and need parts or service, let us know. 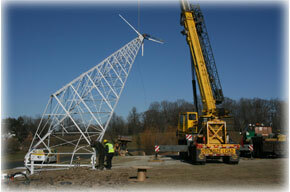 Genuine Jacobs Wind Energy Systems® have proven they can stand the test of time worldwide Since 1925. In 1980 a restart of production of Jacobs Wind Energy Systems® began in Minneapolis, with marketing of larger 10 – 20 kW systems. Most of these nearly 2,000 wind systems produced from 1980-85 were grid connected. The majority of them went to pioneering windfarms in Hawaii and California. 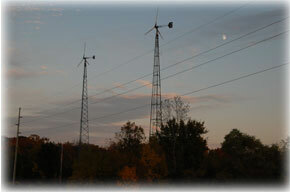 In Minnesota Jacobs Wind units have been connected to Rural Electric Cooperative (REC) grids since 1981. 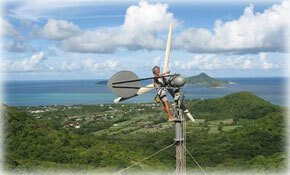 In 2010 many are still on line selling renewable wind power (AG-WATTS®). Today, the firm’s designers (several now in their 4th decade in the wind industry) are working with local RECs on a new generation of consumer wind systems sized to ever larger consumer electric loads at distributed rural sites.